A new car for used car money, what’s not to like? Although the Sandero is hardly the last word in refinement, material quality, or driving pleasure, and we’d like to see some additional safety kit included in its make up, it is undeniably incredible value for money. 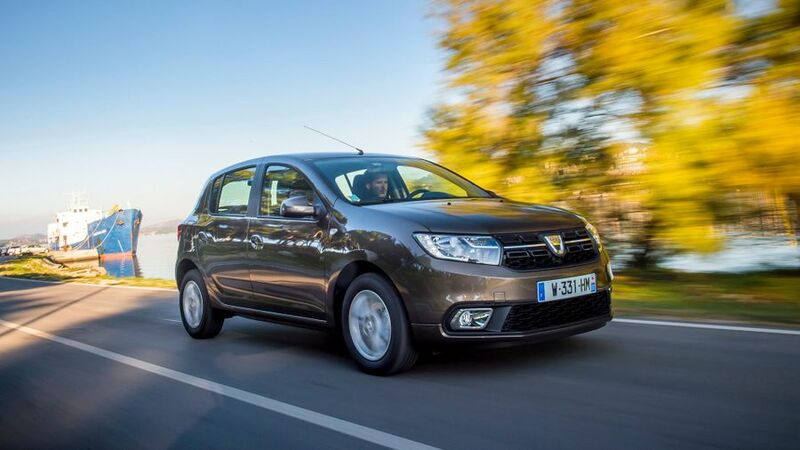 The fact that Dacia is able to build a range of motors that allow those constrained by a tight budget to savour the experience of owning a brand new car, is something we can only roundly applaud. This is especially true when it’s one that provides spacious, airy and comfortable accommodation, along with affordable running costs, and a three year, 60,000-mile, peace of mind warranty. 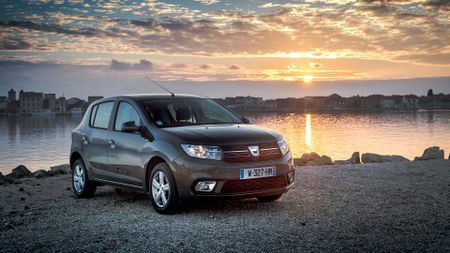 Dacia doesn’t like to think of its cars as ‘cheap’, preferring instead to describe them as ‘affordable’. We don’t really care how it chooses to label them, we just love the way the Sandero offers as much space as a family-sized hatchback for sub city car money. In fact, at £5,995 for the entry model, the only real alternatives to the Sandero are to be found in the Auto Trader classifieds. Even then, for this kind of money, you’re not about to find any pre-owned cars that provide you with the intoxicating aroma of rubbery newness, or the certain reassurance that no previous ham-fisted owner has abused your pride and joy. What’s more, you’re unlikely to track down many used vehicles that come with the sleep-easy assurance of a three year 60,000-mile warranty. For 2017, the Sandero has been given a bit of exterior spruce up, along with a bit of a shake and vac inside. Not wishing to be too flippant, but there’s really not all that much that’s new. 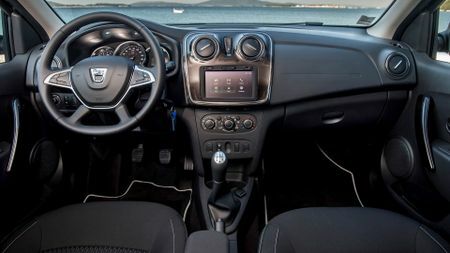 Externally, there’s a pair of restyled bumpers, a new honeycombed grille, and a fresh lighting theme that includes Dacia’s new signature daytime running lights that feature a quartet of Oxo cubed incarcerations in each cluster. There’s also a fresh set of wheel designs, as well as a new shade of brown, sorry, ‘Mink’ paint. Inside, pride of place goes to a posher looking, softer feeling, four-spoke steering wheel, with integrated control buttons for cruise control and speed limiter buttons on higher Laureate versions. Don’t get too revved-up though, as it still only moves up and down and provides zero in and out action. Some new seat materials are also included, alongside a splash of satin paint around the air-vents and centre console, and a dab of chrome on the door release handles. While the electric window switches have been moved from the centre console to the doors for easier use, there’s also a holster style pocket on the side of the front passenger seat to stop your mobile from flying around the cabin. Further back, as well as a 12-volt power socket, there’s an additional bottle holder located in the rear of the centre console. Equipment levels have also gone up a notch. Although the bargain basement Access spec remains bereft of much in the way of niceties, air-conditioning, a USB port, Bluetooth connectivity, remote locking, and hill start assist now come as standard on Ambiance models, although this will set you back an additional £1,000 over the base car. Cruise control, a 7-inch touchscreen, sat-nav, Bluetooth, and rear parking sensors are all part of top of the range Laureate trim. Unfortunately, there is a bit of a fly in the ointment for those wishing to upgrade, as this trim is not available with the all-new entry three-cylinder engine. Consequently, you’ll need to trade up to the more powerful, more expensive, turbocharged TCe 90 engine if you want to up your creature comforts. Something else to consider before buying a Sandero is its relatively poor EuroNCAP rating. Although all models come with full electronic stability control, we don’t consider the four airbag tally sufficient in this day and age. Also, the four-star crash rating achieved is disappointing, especially when you consider how closely parent company Renault works with EuroNCAP and also how most modern small family hatchbacks have no problem achieving a maximum five stars. 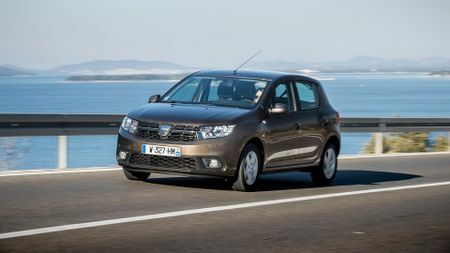 The good news is that Dacia sources its engines from Renault, and it is first in the queue for the bang-up-to-date 74bhp 1.0-litre three-cylinder petrol engine. The bad news is, because of the Sandero’s fundamental lack of sound proofing, the engine always sounds pretty darn vocal. Emitting an obvious three-cylinder crackle from the get-go, it gets increasingly shouty when worked hard. Despite the obvious noise, and a fair bit of discernable vibration – both through the pedals and the steering wheel – to its credit, it makes a fair fist of dragging the Sandero along at a respectable pace. Along with the engine noise, the Sandero’s cabin sounds quite open to the elements so you’ll also have to put up with a fair bit of wind- and road-noise when you get up to motorway speeds. The suspension is not the most sophisticated, either. While the ride feels rather sloppy and the suspension sounds quite clattery around town, there’s also a fair bit of roll in corners to contend with. And because the steering is especially slow, you have to give it a good old tug well in advance in anticipation of the delayed reaction when you want to change direction. As well as being big on value, the Sandero is big on space. There’s plenty of room up front and those in the rear – especially if they are familiar with being crammed into the rear of a supermini – will feel like they’ve won the lottery, thanks to generous head-, leg- and elbow-room. What’s more, because the Sandero has such large side windows, it actually feels even bigger than the tape measure suggests. 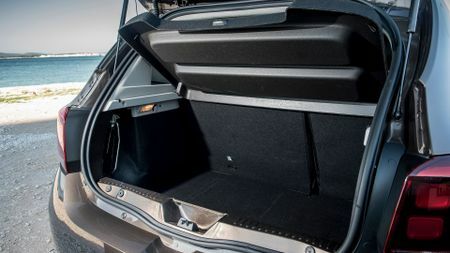 Judged by supermini standards, the boot is pretty capacious too, at 320 litres, although that figure falls a fair bit short of the 380 litres you’ll find in a Volkswagen Golf. While flipping the 60/40 split rear seat backs frees up a useful 1200-litres of load space, the backs of the seats don’t fold entirely flat, so you’re left with a pronounced step in the load area. That’s fine if you’ve only got a few bags of garden refuse to dispose of, but not ideal if you need to transport that clapped out washing machine to the great laundry in the sky. Given the price, and despite the subtle upgrades, it’s hardly surprising that the cabin finish is still not particularly inspiring. While the door panels and dashboard fascia are moulded from shiny, brittle plastics, and the seat height adjuster – don’t get too excited, it’s not a standard fit – is little more than a length of steel bar with a loop twisted in the end, the carpets, boot-lining and the headlining look and feel like they are produced from reconstituted army blankets. Clearly, the Sandero is not the most refined car and it’s certainly not big on frills, or thrills, but it does offer plenty of space, the reassurance of a comprehensive three-year-warranty, and phenomenal affordability, so it’s difficult not to think of it as an absolute bargain. We’d suggest going for the Ambient trim to get the added comfort of air-conditioning. While it’ll add £1,000 to the sticker price, it will certainly make your Sandero a lot easier to sell in the future. Ford has done a cracking job of turning this Indian-built runaround into a very credible budget supermini for the UK. It’s not up there with the best small cars for quality, style or desirability, but it’s very spacious, good to drive and really affordable to buy. If those are your priorities, then give it a look. 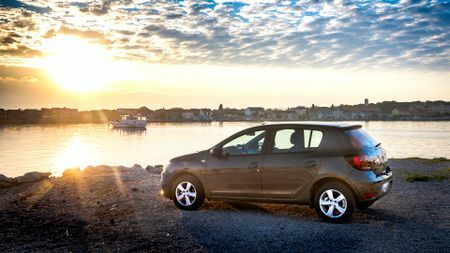 The Citigo is close to being the perfect small car, with a surprisingly roomy interior, nippy engines and a fine balance of ride, comfort and fun handling. 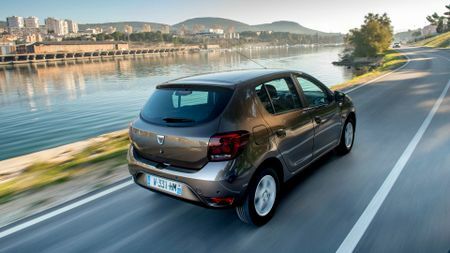 It doesn’t provide the same amount of interior space as the Sandero and the boot is tiny, but overall few rivals have such a broad range of talents. The closest thing to the Sandero, on price if not on size. It’s effectively a city car that provides decent space and lots of standard equipment. It’s not the most comfortable or quietest car however, and it feels rather dour inside. Interested in buying a Dacia Sandero?